Understanding and forging the relationship between the STEM experience and our identities begin at the elementary-school level. Last semester, we worked to develop lesson plans and activities targeting elementary-aged children to foster enthusiasm for STEM from an early age and engage in a conversation about stereotypes in STEM. This semester, we implemented these workshops with three different groups of elementary-aged children and interviewed elementary school teachers to gather their their perspectives on student engagement in STEM. We hope to continue these workshops in elementary schools and have room for follow-up meetings to engage in deeper conversations regarding HSTEM. In addition to the STEM activity, we included an inclusivity component to challenge the internalized biases that may prevent elementary students from engaging in STEM. We chose scientists who did not have the conventional identity markers of scientists portrayed in the media. We included below the detailed workshop, as well as all of the material handed out during the workshop. The intervention was first piloted out to a group of 4 students (2 seventh graders, 1 eighth grader, 1 eleventh grade) through Amherst College's Splash! program. We then conducted the workshop to the 5th grade class at a local elementary school, Crocker Farm. There were total of 37 students at this workshop. The enrollment data of the entire Crocker Farm course can be found here, which was representative of the racial and gender distribution of the students in the 5th grade course. The goal of our workshop was to change the narrative around who can be a scientist by a combination of a fun science activity on a scientific concept and a discussion on who can be a scientist . We hope that in the near future, students will no longer exclude certain scientists based on their identities. Students were very excited for the workshop and showed enthusiasm in the scientist inclusivity component. Students chose the well-known scientists (e.g. Einstein) the most, and in general, picked female scientists less. In particular, woman with the hijab had the lowest frequency out of the scientists. Neil de Grasse Tyson was the only male scientist of color, and he was the third least chosen among the students. In our discussion, however, students mentioned that "anyone an be a scientist" and when asked for reasons for not choosing some of the scientists, mentioned that their posture and props in the picture affected their decision. The older group in Splash! workshop showed more internalized bias on who could be a scientist, raising a question on when stereotypes on who can be a scientist is internalized. The students also showed enthusiasm about learning more about DNA after the workshop. Many of them read the DNA handout at the end of the workshop and continued to make their DNA model. They mentioned that "It's happy to show friends DNA made yourselves", "You get to use creativity", and "I had so much fun." The pre-workshop group had a mean of 3.3 for their rating on excitement for STEM compared to the post-workshop group's mean of 2.0. The median for each of the groups were 3.0 and 1.0, respectively. This shift in the mean and median shows promising results on the efficacy of these workshops in increasing students' excitement for STEM. To the left is the distribution of the survey pre- and post- activity. As shown, the distribution of the pre-workshop had a wider range and more skewed to the right than the post-workshop group. 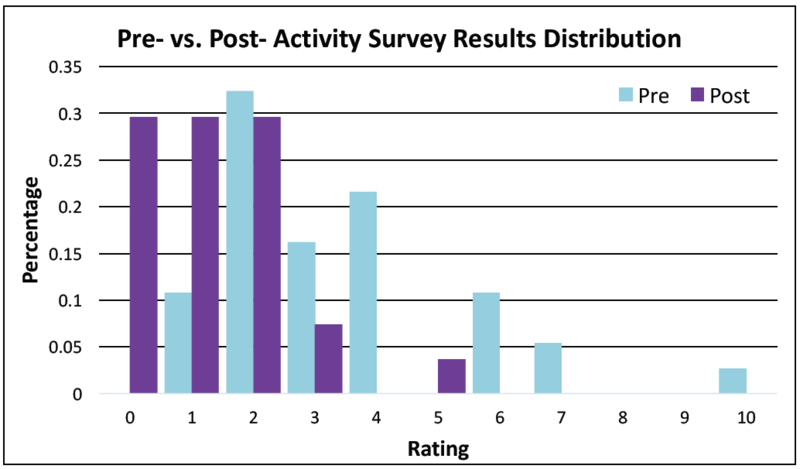 The distribution shift suggests that the activity had students more excited about STEM. Many of them, in fact, mentioned how they'd like their STEM classroom to be more interactive. The result can also be visualized in the boxplot below.